Senior MPs are trusted less to tell the truth and not to misuse power. Public trust in senior politicians has fallen in the last two years, according to a survey carried out for the Committee on Standards in Public Life. The survey suggests 22% of people think government ministers tell the truth - down from 27% in the 2006 survey. Committee chair Sir Christopher Kelly called the results "deeply disturbing". And he said a cause was that greater openness "meant people become aware of things which previously were carried on but they didn't know about". Sir Christopher told BBC Radio 4's World at One that a fall in trust was a consequence of "much greater transparency and openness than there was". He said the solution to restoring the public's faith in politicians would only be achieved once the dispute over party political funding was reformed and issues surrounding MPs allowances were sorted out. 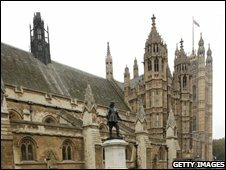 The survey suggests 42% of people thought ministers were dedicated to doing a good job for the public, down from 46% in 2006. However there were some improvements - 26% of those questioned said they trusted national politicians to explain the reasons for their actions and decisions, up 3% since 2006. The results also suggested that people feel more comfortable with locally elected representatives, compared to national representatives. Sir Christopher said he had already discussed them with the prime minister and leader of the House of Commons, Harriet Harman. "National politicians, whether MPs or ministers, continue to languish near the bottom of the league tables, ranked alongside estate agents and tabloid journalists," he said. BMRB Social Research surveyed more than 2000 people in the UK between January and March this year, when MPs' expenses were under the microscope and Peter Hain had resigned from the cabinet after his deputy leadership campaign donations were referred to the police. Sir Christopher told a press conference in Westminster that he was concerned by the lack of resolution within Parliament over party funding. He called for political parties "to have the courage to work together to reach a consensus" and said it was "a matter of great dismay that this has not happened and may not happen until after the next election". Sir Christopher announced the Committee on Standards in Public Life will not be launching its own inquiry into the issue until Autumn 2009 at the earliest, if at all. Questioned about the recent so-called Deripaska affair, involving shadow chancellor George Osborne and business secretary Peter Mandelson, Sir Christopher said that "these episodes demonstrate a fairly critical importance of sorting out the issue of party funding".